1 The public generally expresses more worry than enthusiasm about emerging automation technologies – especially when it comes to jobs. U.S. adults are roughly twice as likely to express worry (72%) as enthusiasm (33%) about a future in which robots and computers are capable of doing many jobs that are currently done by humans. They are also around three times as likely to express worry (67%) as enthusiasm (22%) about algorithms that make hiring decisions without any human involvement. By comparison, Americans tend to hold more balanced views toward driverless vehicles and robot caregivers. 2 Americans are reluctant to incorporate these types of technologies into their own lives. When asked whether they would or would not personally use specific automation technologies, around six-in-ten U.S. adults say they would not want to ride in a driverless car (56%) or have a robot caregiver for themselves or a family member (59%). Views on applying for a job that uses a computer program to evaluate and select applicants are even more negative: 76% of Americans say they would not want to apply. 3The public supports policies that would limit the scope of automation technologies. The vast majority of Americans (87%) would favor a requirement that all driverless vehicles have a human in the driver’s seat who can take control of the vehicle in the event of an emergency, with 53% favoring this policy strongly. And in the event that robots and computers are able to do most of the jobs that are done by humans today, 85% of Americans are in favor of limiting machines to performing primarily those jobs that are dangerous or unhealthy for humans. Majorities also say they would favor the federal government offering a guaranteed income (60%) or creating a national service program that would pay people to perform tasks even if machines could do the job faster or more cheaply (58%). 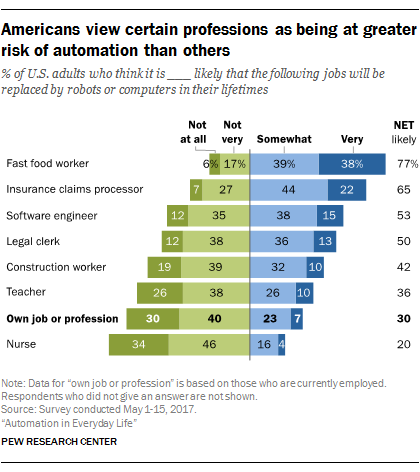 4 Americans think automation will likely disrupt a number of professions – but relatively few think their own jobs are at risk. A majority of U.S. adults say it is at least somewhat likely that jobs such as fast food workers (77%) and insurance claims processors (65%) will be mostly performed by machines in their lifetime, while around half expect that the same will be true of jobs such as software engineers and legal clerks. On the other hand, only three-in-ten workers think it’s at least somewhat likely that their own jobs will be mostly done by robots or computers during their lifetimes. 5Some workers report that they already have been impacted by automation. In total, 6% of U.S. adults say they have ever personally lost their job, or had their wages or hours reduced, because their employer replaced elements of their position with a machine, robot or computer program. The youngest adults are the most likely age group to report that they have been personally impacted by automation: 13% of Americans ages 18 to 24 have experienced at least one of these impacts. 6Americans worry widespread automation will lead to more inequality and leave people adrift in their lives. Roughly three-quarters of Americans (76%) expect that widespread automation of jobs will lead to greater levels of economic inequality than exist today, while nearly two-thirds (64%) expect people will have a hard time finding things to do with their lives. At the same time, few Americans – just 25% – say that widespread automation will lead to the economy creating new, higher paying jobs for humans.